I’ve been eyeing Spud and Chloe’s Sweater yarn for quite a while. I’ve heard great things about it so when they let me try some out I was super excited! Spud and Chloe Sweater is a worsted weight yarn and is made by Blue Sky Alpacas. It’s 55% wool and 45% ORGANIC cotton. First of all, I love the fact that it is superwash. I don’t always have time to hand wash, or air dry items so I tend to go for yarns I can throw in the wash when needed. Picking a color was hard. All the colors are so rich and yummy. It took me a while but I finally settled on Moonlight and I was not disappointed. The color is absolutely gorgeous! The Squid loved it too so I figured I’m make something for her with it. I decided to make something small and pretty simple to give the yarn a try . As I worked with the yarn I fell in love. It’s extremely soft and “cushy.” I decided to throw a small swatch in the wash to see how it held up. It did great! No pilling and it came out just as soft as when it went in. The fiber is extremely strong and with it being almost half cotton/half wool I could see this as a great yarn for winter or warmer months. 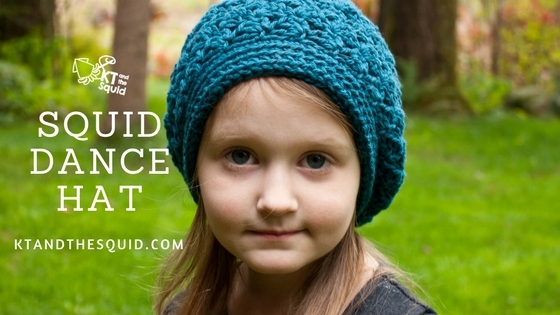 Here’s the hat I made (free pattern below). I usually test the scratchy-ness of yarn with the Squid’s head. She’s really picky about wool being scratchy and she had absolutely no complaints about this one. Always a good sign! After looking around online. The only complaint I would have about this yarn is that it is on the pricier side BUT it’s well worth it. I could imagine this making a fabulous sweater to wear for a long time. Overall, I highly recommend giving this one a try. I can’t wait to use it again! If you’d like to purchase the yarn they suggest buying from Jimmy Beans Wool (click here). You can also visit Spud & Chloe’s website to check out their other yarns (click here). If you’d like to sell finished items from this pattern please do! Finished items belong to you and you may do what you wish with them. If you choose to sell them on Etsy please credit me (KT and the Squid) as the designer. I recommend selling finished items for $20-$30. All KT and the Squid patterns are tested by wonderful volunteers. If you have any questions or need help please contact me at www.ktandthesquid.com. *Save time and check your gauge! Circumference is measured at the bottom of the hat. This hat is worked in the rounds from the bottom up. You will sew up the top to finish. The ch 1/ch 2 at the beginning of each round will NOT count as a st.
Be sure to pay careful attention to the turns. You will join each round with a ss to the top of the first st of each round. When the instructions say to work into the side of the sc, insert your hook into the left (right if you’re a lefty) side 2 bars of the sc. Round 1 (RS) – Fsc66(72), being careful not to twist, join with a ss to the first st.
Repeat round 6, 7(9) more times. Fasten off leaving a long tail, sew up the top, weave in all ends. Disclaimer: *The wonderful people at Blue Sky Alpacas supplied me with the yarn for this pattern. Even though I love the yarn their generous donation has not biased my opinion of their product.